The mere mention of Venice conjures an air of irresistible romance. With its iconic canals, delectable food and wine, and fascinating mix of architecture, art, and history, “La Serenissima” is truly one of Italy’s most magical destinations. A dominant world power for more than a millennia, Venice’s beauty may be faded, but it’s all the more precious for its age. Whether you’re getting lost in its maze of narrow streets or exploring its calm canals, the city’s lavishly decorated palaces, churches, and piazzas meet your eye and stir your heart. Venice’s Centro Storico, home to about 272,000 people, is laid out across a series of 122 small islands in the shallow Venetian Lagoon, just off the Adriatic Sea. The 150-some canals dug across those islands, and the more than 400 bridges that cross them, are Venice’s defining feature, but gondolas and water taxis are only the beginning of what this city has to offer. Dotting the city are sprawling squares, ornate palaces, and centuries-old basilicas. The heart of the city and its most famous square is the Piazza San Marco, dubbed “the drawing room of Europe” and first laid out in the 800s in front of the Saint Mark’s Basilica. Surrounding the square are some of the city’s most breathtaking sights. Venice’s humble origins give no hint of the mighty sea power the city would become. First populated in the second century by Italians fleeing the Barbarians, Venice’s first few centuries were a roller-coaster ride of invasions and conquests by the Visigoths, the Huns, and the Lombards, among others. But by the middle ages, Venice had asserted its independence. Eventually, the city declared itself a city-state and the Venetian Republic. The city’s strategic location on the Adriatic Sea ushered it into a heyday of unrivaled commercial and naval success, leading it to be a trade leader and a fearsome maritime power that dominated the Adriatic, the Aegean and the Mediterranean Seas. Such success brought Venetian families great wealth, and their struggles to one-up one another by building the best and biggest palaces, patronizing the most talented artists, and decorating their city with the most beautiful plazas and halls endowed Venice with the awe-inspiring art and architecture we enjoy today. Venice’s above-water wonders are it’s most famous, but no less interesting are those found in the murky depths of the lagoon. Thousands of wood piles brought in from areas now in Slovenia and Croatia support Venice’s stately buildings; many of them have been submerged for centuries and continue to bear the weight of imposing stone and brick buildings. Yes, Venice has sunk considerably, but not because of faulty foundations. Wells dug beyond the lagoon proved to be the source of the problem, but since artisan wells were outlawed in the 1960s sinking has slowed considerably. Still, in some old houses problems with ground-floor flooding has forced people to abandon the lower level of their home or business. Venice is surrounded by high-quality wine regions. The famous local tipple “Bellini” is made with peach juice and sparkling Prosecco. Prosecco is a beautiful wine region located about 90 minutes north of Venice. Located west of Venice, you will find the vineyards of Valpolicella, where the famed Amarone is made with partially dried grapes. Also in the Veneto, delicate white wines are made in Soave. And far north east of Venice is the gorgeous region of Friuli, where Italy’s most exciting white wines are made. Given its privileged position on the Adriatic Sea, Venice is a paradise for seafood lovers, who can enjoy local specialties like fritto misto di mare (fried shellfish), baccalà (codfish) or risotto alle seppie (rice with cuttlefish ink). A favorite way to eat out in Venice is to go out for “cichetti”, small portions of food rather like Spanish tapas that are served at bars all over the city. Cheeses and sausages, stuffed tomatoes, shellfish, and seafood… anything can be turned into a perfect bite-sized cichetti. Eat a half dozen of these tiny plates accompanied by an Ombra (a small glass of a simple Italian wine), and that’s a meal. Since the 9th century, this sprawling square has been the heart of Venice. Come to marvel at the gorgeous palaces and churches lining it, to stroll its porticoed edge or watch the world go by from one of its terrace cafes. Few of the world’s religious monuments can rival Saint Mark’s for opulence and luxury. Consecrated in 1094, it is particularly famous for the golden mosaics adding glitter to the glamour of the doorways in the façade and the domes in the Basilica’s interior. On the Piazzetta San Marco, the white and pink façade of this Gothic palace offers visitors a rare glimpse of civil Venetian Gothic. Constructed from 1309 to 1424, this lavish palace was the center of the Venetian Republic. Collector Peggy Guggenheim (1898-1979), who for 30 years lived in the house now containing this museum, had eccentric tastes running the gamut across all the major artistic styles of the 20th century. Her collection of masterpieces includes works by Pablo Picasso, Salvador Dali, Jackson Pollock, Mark Rothko, and Francis Bacon. Dubbed the “Golden House”, this 15th-century Gothic creation is no longer as golden as it once was (the name comes from the gilding that once covered the façade) but it is still a wonderful place to see Italian Renaissance art and, as a bonus, to enjoy fabulous views over the Grand Canal from the balconies of the Franchetti Gallery. 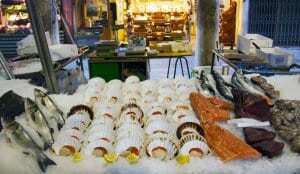 The city’s premier market, vendors have been hawking their fresh fish and vegetables, cheeses and hams, wine and even horsemeat here for nearly a millennia. Europe’s premier art festival, Venice’s Art Biennal began in 1894 and has been bringing together the very best in Italian and international art ever since. 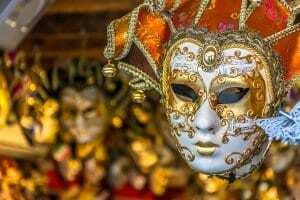 Dating to 1162, the Carnival of Venice (held the two weeks before the Christian holiday of Ash Wednesday) is one of the city’s most exciting celebrations. Carnival masks, used from the 13th century onward and often made of paper mache, held an important place in Venetian society.